The branch is fortunate to have two charity shops, in Derby and Wirksworth.. The income from these shops provide us with vital funds that ensure we can carry out cat welfare work which you can read all about on this website. Both shops welcome donations of good quality used clothing, bric-a-brac, books and collectables etc. Donations can be dropped off directly at the shops during their opening times shown below. The shops also depend on volunteers who can make a regular commitment to help sell, sort and tidy. If you are interested in volunteering as a shop helper please visit our Support Us page. 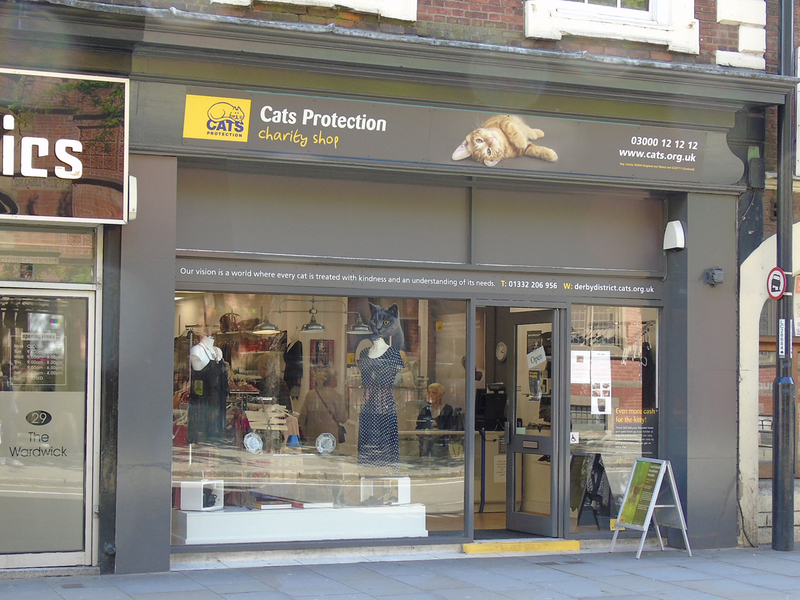 As well as quality second hand goods (pop in and get yourself a bargain), there's also a good range of Cats Protection merchandise which makes a great gift for cat lovers - or why not treat yourself!